determine what is living and intelligent in nature. data and ideas relevant to metabolic architecture. are appropriate to hybrid biological buildings. In Metabolic Architectures: Turing, Sullivan, Autopoiesis & AI, Dennis Dollens writes a manifesto for dialectically bracketing AI with plant and microbial intelligence when we consider them scientifically, phenomenally, and environmentally. Dollens further argues that architecture is as much a part of nature as spider webs, beehives, and cricket burrows, thereby establishing buildings as biologically derived, extended phenotypes. Proposing a theoretical Extended Autopoietic Operating System (EA/OS) by means of computational simulations, hybridization, and genetics, he situates autonomous and microbially-intelligent buildings as metabolic within a machinic phylum. On this basis, Metabolic Architectures challenges us to develop non-human, sentient roles for buildings and cities where bio and AI intelligences serve as sentinels, organizers, and actuator-organisms to mediate climate change. Dollens develops his analysis from close observations of Alan Turing’s morphogenetic drawings and papers as they relate to algorithmic programming and machine intelligence. From Louis Sullivan’s A System — unfolded as a precursor and analog corollary of Turing’s work — he extracts ways of hybridizing botanic life with geometric forms. Following Richard Dawkins, he concludes that metabolic architectures are extensions of human biology and thus biomachinic parts of nature. And by reformulating Turing’s question, “Can machines think” as Can buildings think — his book seeds a debate on the ways that architects may visualize biointelligent, performative buildings — buildings as sensory agents in the environment. Metabolic Architectures strategically expands biological theory from Maturana and Varela’s Autopoiesis and Cognition with adaptive modifications from contemporary philosophers and scientists. In this strategy, Andy Clark’s research on extended cognition, underpins the hybridization of theory and practice to construct scaffolding for design, tool making, and architecture as inseparable from urban and wild nature. 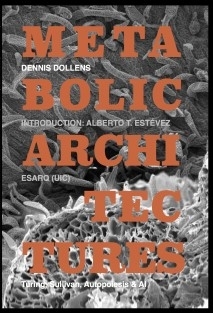 In his introduction, Alberto T. Estévez references university biodigital and genetic-architectures investigated and prototyped in ESARQ’s Biodigital Architecture Master and Ph.D. Program, a program Estévez founded and directs and where Dollens teaches. In that context, Dollens illustrates and explains steps by which architecture may evolve toward biological life by hybridizing microbial and/or plant intelligence in a process impacting and impacted by AI, ALife, and synthetic biology. Metabolic Architectures posits bioarchitecture as big machines in¨the midst of other machines, such as computers, smartphones, and neural-net programming to guide experimental research and studio practices toward the integration of algorithmic morphology from nature. Once understood as gigantic machines — intelligent, sensory architectures stake a position in debate where monitoring and recognition of toxins and their bioremediation emerge as immediate concerns. Metabolic Architectures, thereafter positions cognition and nature in the setting of bioreactive architecture design, partnering architects with microbial intelligence, AI, and technology to conceptualize sentient buildings as remedial agents addressing, for example, climate change through sensory and biochemical, carbon-eating bacteria.